Sandra Koberlein: Sandra exhibits her work in competitive galleries, art centers, hospitals and universities both locally and nationally. Her work has won numerous awards and is held in private collections. 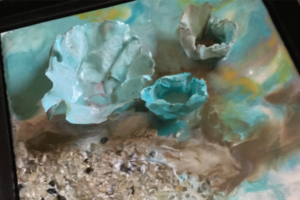 She is a certified K-12 art teacher and encaustic instructor. Sandra conducts workshops at art centers and in her Woodstown, NJ studio. She serves on several non-profit boards, supporting visual and performing arts and arts education.